"At its core, evidence-based medicine challenges physicians to be more critical in their appraisal of the evidence and to weigh all of the evidence relating to a particular clinical scenario appropriately. More to the point, evidence-based medicine delivers the tools to do so." "For these reasons, evidence-based medicine can and should play an integral role in the effective practice of medicine." With these words, Dr. Gordon Guyatt and Dr. P.J. Devereaux of McMaster University sum up the critical role evidence-based medicine plays in improving patient care. But how often in your busy life as an emergency physician do you have time to critically appraise all the available literature on a given topic and then apply it to your patient? That's where Emergency Medicine Practice comes in. For over 10 years, Emergency Medicine Practice has been providing emergency physicians like you with the tools they need to provide the very best in patient care. Each month, Emergency Medicine Practice covers a topic critical to the practice of emergency medicine -- from Neurologic Emergencies, to Cardiovascular Emergencies, to Trauma, to everything in between. But Emergency Medicine Practice takes a different approach from other CME resources. 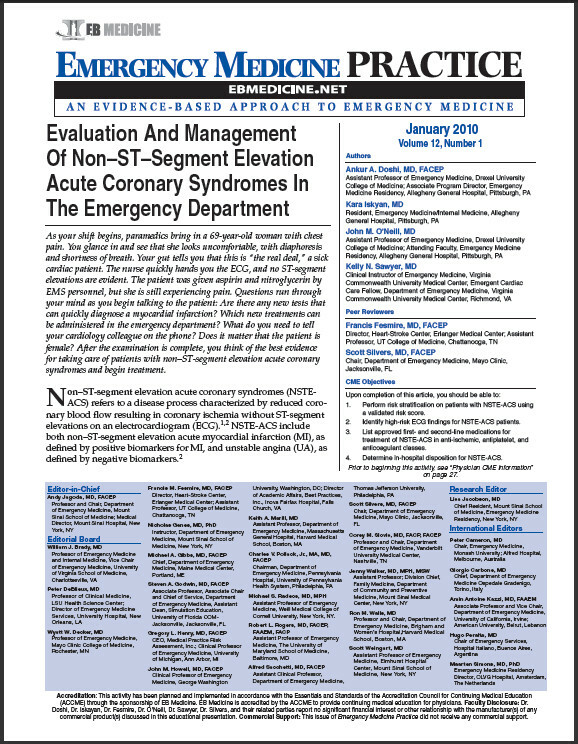 In addition to critically appraising the literature, Emergency Medicine Practice articles provide you with a number of important clinical tools. These tools include targeted questions regarding the patient history and suggestions regarding a focused physical exam. We concentrate on the “big-ticket” questions and help you as a practicing physician in your search for crucial physical findings. With your Emergency Medicine Practice subscription, you receive 12 monthly evidence-based print issues designed to improve patient care. And each issue includes 4 AMA PRA Category 1 CreditsTM, 4 ACEP Category 1 credits, 4 AAFP Prescribed credits, and 4 AOA Category 2B credits -- that's 48 evidence-based CME credits per year. Plus, you also receive full online access to our entire article database -- more than 130 evidence-based articles -- and you can earn up to 4 CME credits from any issue published within the last three years (that's an additional 144 CME credits at no extra charge!). In addition, you'll receive a complimentary subscription to EM Practice Guidelines Update. This monthly online publication is designed to help you incorporate Clinical Policies relevant to emergency medicine into your daily practice. With it, you also receive 12 AMA PRA Category 1 CreditsTM per year. For more than 10 years, thousands of emergency physicians around the country have trusted Emergency Medicine Practice to keep them up to date. We'd like to invite you to become a subscriber too -- for just $279 per year, you receive monthly evidence-based print issues, 48 CME credits, full online access to searchable archives & 144 additional CME credits, and a free subscription to EM Practice Guidelines Update. contact us to receive a full and immediate refund. No questions asked. And you keep all the issues and CME credits you’ve received.